As you get new credit cards or you begin to pay off debt and cut back on credit card usage, some of your credit cards may go unused. Is it worth it to keep these credit cards or should you close unused credit cards? Many credit card issuers close inactive credit cards after the cards have been dormant for a certain period of time. The time varies by credit card issuer, but after 12 months of no use, it’s safe to assume your credit card is at risk of being closed. If you don’t want that to happen, you should use your credit card at least once a quarter to keep it active and open. Credit cards play a major role in helping you build a good credit score. A credit card with a large amount of available credit can help boost your credit score because it lowers your credit utilization – the ratio of your credit card balances to their credit limits. If you close a credit card with available credit, it may hurt your credit score. 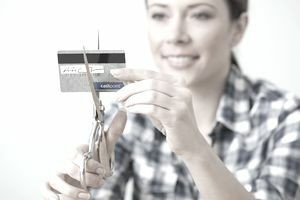 Age of credit is another factor to that comes into play when you’re considering whether to close an unused credit card. Having old accounts on your credit report helps your credit score because it shows that you have more experience with credit. Credit bureaus will report credit cards closed in good standing for about 10 years, so take that into consideration when you’re deciding whether to close a credit card. Retail stores' favorite ploy to get credit card signups is the initial discount on purchases. You may sign up for one of these credit cards just to get the discount, even though you don’t really want the credit card. Closing one of these credit cards won’t cause too much damage to your credit score. Plus, retail credit cards, especially those that aren’t co-branded with a major credit card issuers, typically aren’t the best credit cards to have in your wallet. While leaving a credit card open can help your credit score, it’s not always worth it to leave cards open. For example, if you have an unused credit card that’s charging you an annual fee, you should use it or close it. Paying a fee on a credit card you’re not using is a waste of money. What counts as “too many credit cards” may vary from one person to the next. We don’t know the exact number of credit cards that are best for your credit score. But, if your credit cards are unmanageable, closing the ones you aren’t using will make it easier to keep your finances on track. If you ultimately decide to close an unused credit card, it’s best to pay off the balance first. Then, call your credit card issuer and request to have the credit card closed. You can follow up with a letter reiterating your desire to close your credit card. In a few months, check your credit report to confirm the credit card is reported as closed.